You'll just have to ignore it. It's not a warning, and it's not complaining. 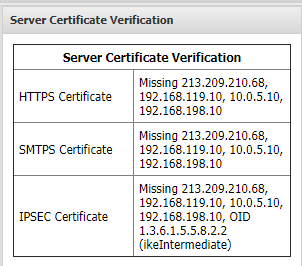 It's just letting you know that some of the names and/or IP addresses configured on your server aren't included in the certificates enabled for those services. That means network clients on your LAN attempting to access, for example, a block page with https://10.0.5.10 in the URL will get a certificate warning in their browser, because that's one of the addresses on your server that isn't listed in the certificate. That may not even be a consideration for you if you're not running with the applications and a configuration where it is required. If you need to use a server certificate that was created and trusted by a standard cert provider, as I'm assuming is the case here, it's perfectly normal. It's really something to look at if you ARE having those kinds of problems (cert errors on network clients, problems with IPsec connections, etc.) If things are working okay, you can safely ignore.